Drapery Valances is a great way to finish your windows! Have you considered finishing your windows with drapery valances? Valance treatments can be very attractive, affordable, and will expose more of the view if they are used alone with out the side panels. I often get asked, full length draperies or valances,what are the better choices for my windows? The size of the window. The decorating style of the room and what is the out come one wants to have in the room. The pattern of the fabric to be used, large prints, with large repeats will show better with tall panels, where mini prints will work better on valances. These are some ideas to think about when in doubt whether to use drapery panels or a valance. Call 630 420-0800 for free estimate. Dress your windows with valances! Valances, are the best way to dress a window with out sacrificing the view. It gives your window the finished look, will add warmth to any room, and you will have your view as well. Be creative, take a look at the drawing below, it is a proposed valance for a high school girl, her mom does not want to spend too much money since her daughter is leaving for collage in three short years, and perhaps the room will be a guest room any way. 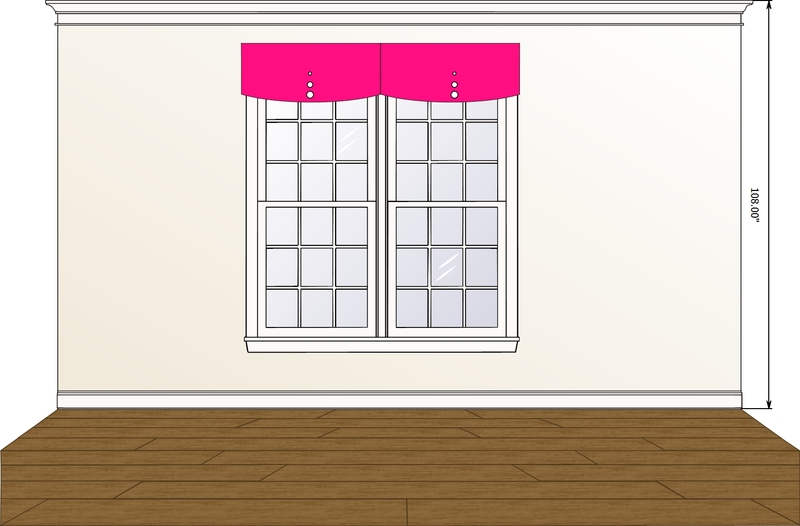 The valance is pleated with two large pleats with curved bottom, the fabric we selected is hot pink! In side the pleat we are using a tiny black and white check fabric, and we have placed three buttons, large, medium, and small, one on top of each other, the bottom one will have the checks, the middle will have a solid black and the smallest one will have the check fabric again! Hot pink valance for a high school girl! Call us for an estimate(630)420-0800.